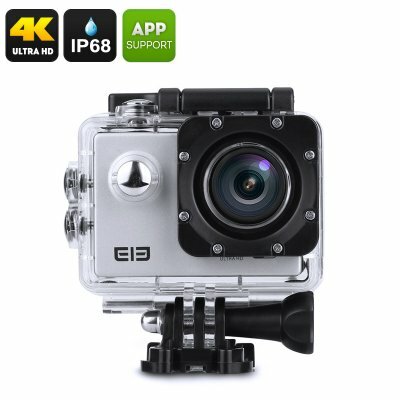 Successfully Added Elephone ELE Explorer 4K Action Camera - IP68, 16MP CMOS Sensor, 170 Degrees FOV, 2-Inch Display, Anti-Shake, Wi-Fi (Silver) to your Shopping Cart. Coming with numerous of different recording modes, this 4K sports camera is perfect for outdoor enthusiasts, extreme sports addicts, and people who are simply looking for a compact waterproof 4K video camera to carry along during their upcoming adventures. No matter where your next adventure will take you, with the Elephone ELE Explorer 4K action camera at hand you’ll always be able to shoot incredible footage and capture stunning 16mp photographs through which you’ll be able to share and recall all your amazing memories in stunning resolution. The Elephone ELE Explorer comes with a 12 months warranty, brought to you by the leader in electronic devices as well as wholesale electronic gadgets..